The summit held at the Hilton Hawaiian Village and sponsored by The Council for Native Hawaiian Advancement (CNHA), was a summit all Hawaiian groups could model themselves after. The conference was an extremely overdue summit that could not have convened at a better time for native Hawaiians. At a time of unease and controversy, Hawaiians have a difficult position in finding a solution that fits all views. However, our friends from Alaska settled that uneasiness by addressing the issue of unity. The group of Alaska Native leaders admitted that any one nation will never have uniform unity. The point is that Hawaiians and Hawaiian agencies ought to begin the processes of collaboration to form a more suitable union for all. 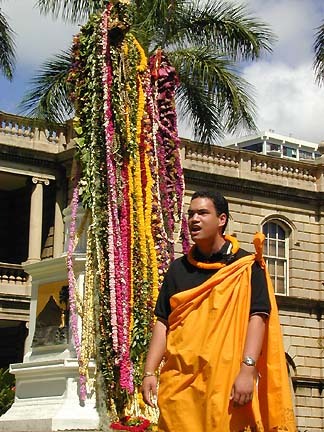 Many solutions were given to exceed the peripheries of poor socioeconomic statistics for native Hawaiians. Among the many solutions given, none could have been more captivating than Byron Mallot's luncheon speech. Mallot's role as a leader in his community currently exists as President and CEO of the First Alaskans Foundation, former mayor of Yakutat, Alaska at age 22, among many other accomplishments. His oration, entitled "Modern Tools for Protecting Traditional Peoples," corroborated the importance of education to each and every child. Though he stressed that the most important children to "reach" are those who show no interest to activities that do not stimulate their cultural surroundings. He advocated in order to empower native peoples, education is an integral part of being a native and surviving in today's western society. Education it seems is a high priority to native peoples today. As the old adage goes, "Education is the key to success." No saying can be more suitable for all native peoples. When one is educated, it brings power and significance in to the moment of which that person has then the ability to speak on fair grounds and to retort what assumptions are made.